Today I am updating the third post and the first recipe that I ever put on this blog on September 1, 2013. It is amazing to look back at my old posts. My first and second posts were also on this day LOL so you can get a look at my first day of blogging AND get one of my husband's favorite recipes that I make. My first post was simply a photo of a painting I had done with one paragraph below. In my second post, a couple of hours later on the same day, I talked about canning salsa (no recipe though) and building a lean to for my hogs. 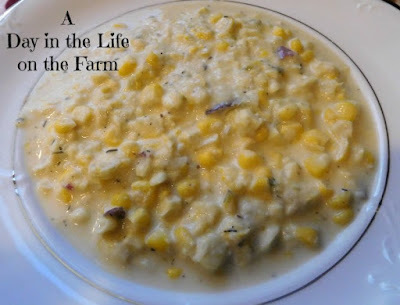 The final post of that first day contained my recipe for Corn Chowder. I shared that each year I make pot after pot of corn chowder at my husband's request and freeze it so we can enjoy it all winter long. 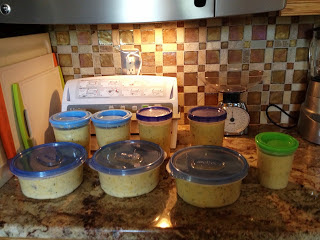 And I shared this photo of all my chowder ready to go into the freezer. No markings on the photo. No editing of the photo. I was green as green could be but I knew that this recipe had to be shared so I shared it. I did know that much about blogging! It is now nearly 5 years later. I'm still blogging (sometimes multiple times a day) and I am still putting up corn chowder each and every year. I pulled some out of the freezer the other day and served it up for dinner with these Ranch BBQ Beef Sandwiches. This time I made sure to get a photo of the actual chowder. It is like summertime on a spoon regardless of the weather outside. Please link back to the original recipe. It is written for 4 servings but is easily doubled and quadrupled. I'm anxious to hear how you like this soup, please stop back and let me know. I love that you revisited that first post, and my husband will love the chowder! It is the best chowder ever Jolene. Great choice to go back to your first recipe! I want to make this as soon as we get fresh corn here. It is perfect with the cream of the crop sweet corn. How great go go back to your first ever recipe, and corn chowder is a favorite. I'm glad you finally got a good pic of it. You know every day it is getting warmer outside and with it (at least in Ohio) is the statewide sea of corn. What a great recipe to have to use some of it. Best corn chowder ever Sue. I have always loved corn chowder. It's one recipe I remember mom making often! This is a great version Shelby. I'm always impressed with how often you post, Wendy! Definitely fun to look back at the very beginning. I'm always impressed at how prolific you are at blogging, and now I know you were a natural from the beginning! Summertime on a spoon...great description! I think I need to dig around in your freezer...it sounds like it's filled with better food than mine! It's getting down to the end now....summer better hurry up and get here. It is so fun to go back and see what some of those early posts look like, even if mine are cringe inducing 😉 this chowder looks delicious! I think we are not alone Carlee and I think we are harder on ourselves than we need be. I like it but Frank's the one who is crazy about it. I love corn chowder and have not made it in ages. Yours looks creamy and delicious. Yes and it will be corn season before you know it. Corn chowder is a great recipe to start your blog with! Loved hearing about your journey! That's a great story! I also love the corn chowder but haven't thought about freezing any. Now I will, next time I make a batch. Tastes as fresh as the day you made it Tina. Ha ha. Isn't it funny to look back on your first years of blogging and laugh and the bad photos, inexperience evident in the posts? But I'm glad the recipe stands the test of time. This is one I'll have to make for my hubby, as he loves chowders as well. This is a definite keeper Liz.